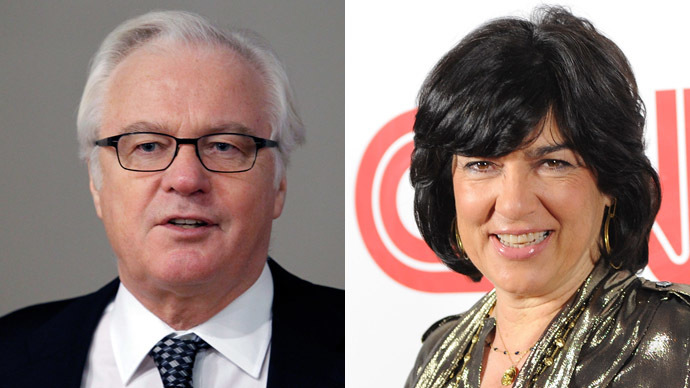 Russian ambassador to the United Nations Vitaly Churkin has issued a response to Christiane Amanpour after the CNN anchor lashed out at the diplomat over his inability to appear on her show and brought his daughter into the equation. In her Thursday show, Amanpour said: "And one more note: we continue to reach out to the Russian government for their comment, including officials such as UN Ambassador, Vitaly Churkin. We haven't had much luck, but perhaps people like Churkin feel they don't really have to leave their comfort zone." I am taken aback by the personal attacks you resorted to in your show on March 20. I have known you for many years (including through a number of on-the-air interviews) and used to respect you professionally. So it was somewhat startling that my inability to give another interview provoked such an outburst. As to my unwillingness, as you put it, to leave my "comfort zone” – you are absolutely right. After 8 meetings of the Security Council on the situation in Ukraine and Crimea (six of them in front of TV cameras) I feel very comfortable that the truth is beginning to come across. If, though, you imply that I don’t want to answer tough questions, then you are mature enough to know that I spoke to the “full house” at the Washington National Cathedral in October, 1983, two weeks after the South Korean airliner was downed, and then testified at the US Congress in May of 1986 after the Chernobyl nuclear disaster, not to mention hundreds of other media and “live” appearances. So I can explain to anyone what “leaving a comfort zone” means. But I wouldn’t be writing to you if you did not also choose to personally attack my daughter – your younger colleague – a Russian TV journalist. I am very proud of her – not only is she a good journalist, but she strictly keeps her professional distance from me. Incidentally, I recall you married the State Department Spokesman. How was your professional credibility in the course of your courtship? Don’t bother to answer. I don’t really want to know.